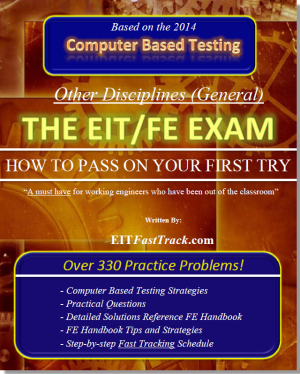 EITFastTrack.com offers supplemental practice problems for the EIT exam with a specific focus on the new 2014 computer based testing format. We designed the problems to help you study for the Other Disciplines (General) Exam. The 3 new topic Areas are included. Our problems are developed by engineers for engineers. We focus on practical problems which are most likely to appear on the actual EIT exam based on percentages provided by NCEES. Since our solutions are very detailed and reference the FE Handbook by page number, we provide the test taker with the most valuable information in the shortest amount of time. We attract mostly working engineers who have been out of the classroom for some time and also recent college graduates. Our practice exam contains Fast Track tips and strategies for conquering the EIT exam. We invite you to download a copy of our free demo of 10 practice problems and be a part of our and community forum.